Transport Secretary Chris Grayling today (29 November 2017) set out a new vision for our railways, including plans to end the operational divide between track and train and an evolution of the franchising system. The proposals – contained in the government’s Strategic vision for rail – also include commitments to expand the railway network to boost housing and economic growth, and deliver major passenger benefits – including rolling out improved compensation schemes for passengers. The sweeping proposals aimed at creating joined up teams running track and train will make the railway more reliable for passengers and ensure that it works as one to deliver for its customers. The reforms build on the Secretary of State’s speech to Policy Exchange in December 2016 and the recommendations of the McNulty and Shaw reports. Building on Network Rail’s recent devolution of infrastructure management to route-based businesses, the plans include complementary changes to the franchising system to ensure that the railway is prepared to manage the challenges of the future, while maintaining the railway infrastructure in public ownership. "The last few years have seen massive growth on Britain’s railways. This industry has reversed decades of decline under British Rail, delivered new investment and new trains, and doubled the number of passengers. "Rail passengers deserve a more reliable, more efficient service – and I will deliver it by ending the one-size-fits-all approach of franchising and bringing closer together the best of the public and private sector." The Strategic vision for rail also commits to explore opportunities to restore capacity lost under the Beeching and British Rail cuts of the 1960s and 1970s by identifying new schemes that unlock new housing or economic growth and offer good value for money. The government is already planning to reopen the railway line from Oxford to Cambridge and our new development programme will identify new connections and lines that were closed to passengers by British Rail, as part of finding and funding future rail schemes which offer good value. At the heart of the new strategy is a commitment to improve passenger experience across the network and take advantage of new technology to improve services. This includes major changes that will extend passenger rights – including compensation for passengers when trains are more than 15 minutes late. We are also supporting the introduction of a Rail Ombudsman to ensure all passengers are treated fairly. The vision also pledges to introduce digital rail – new technologies that have the potential to reduce crowding and improve train punctuality for passengers – across more of the country. This includes funding to develop schemes on the Transpennine Route, on the South East Route and East London Line, and on the Moorgate Branch. It also reinforces the important role for freight on the rail network to support the British economy and environment. The East Coast Partnership will be responsible for both intercity trains and track operations. It will be set up over the next 2 years as a partnership between the public and private sectors, with responsibility for the lines between London, Yorkshire, North East and Scotland. The private partner will have a leading role in defining future plans for route infrastructure. The government and the Office of Rail and Road will continue to ensure that robust protections for freight and other passenger operators are maintained. Further details about the new East Coast Partnership will be set out in the coming months. The government is currently in discussions with the existing operator of the East Coast franchise, Stagecoach-Virgin, to ensure the needs of passengers and taxpayers are being in met in the short term whilst laying the foundations to bring forward the reforms in full under a long-term competitively procured contract. The government is today publishing the invitation to tender for the new franchise on the South Eastern network between London and the Kent coast, which will be headed by a new Alliance director, with a joint team operating the trains and the tracks on a day to day basis. 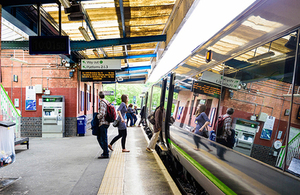 We will publish an invitation for tender in 2018 for the franchise on the Midland Mainline between London and Sheffield, which will also be operated by a joint team. A consultation has been launched on the future of the Great Western franchise, including a proposal to create a new West of England franchise that would provide long-distance services between London, Wiltshire, Somerset, Devon and Cornwall (including the Sleeper) together with regional and local services across the south-west. To provide a period of stability before the franchise is next competed, the department will be asking FirstGroup, the current operator, for a proposal to continue operating the franchise until 2022. The new development programme will identify opportunities to restore capacity lost to passengers under British Rail, as part of finding and funding future rail schemes which offer good value. The government has already created one team to drive forward design, development and fund raising of East West Rail and work is due to start on the next phase of the route in 2018. Other proposals that are in discussion as part of the new development programme include suburban lines around Bristol, a freight route that runs through Central Birmingham, the line from Okehampton to Exeter and from Blyth to Ashington in County Durham. Proposals will need to demonstrate a strong business case where they are seeking government funding. In 2011 Sir Roy McNulty produced a report which identified that a greater alignment of the industry and uniting track and train was a key issue for the railway. One form of reunification he proposed was alliances between Network Rail and train operating companies, which could align teams to form a single operating unit that can work together on a day to day operational basis as well as planning work on the network. McNulty said that there “needs to be better alignment of organisations and their incentives, particularly between Network Rail and train operating companies”. In 2016 Nicola Shaw produced a report into the structure of Network Rail. She recommended that it should be a much more devolved structure. Placing maintenance and upgrades in the hands of local teams, who know how to best improve performance and efficiency.